I've just moved into a new home and the bathroom has no extractor fan. After my weekday morning showers, there's so much condensation left on the windows, just before I have to leave for work. This is a real pain because I really don't like leaving it this way, and of course, I can't leave the window wide open while I'm away all day. The windows also need a jolly good clean, so Tom recommended I try out the Karcher Window Vacuum Cleaner. 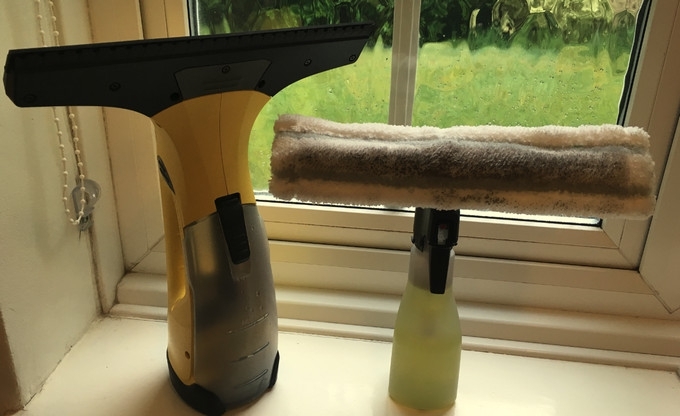 I was shown briefly how to use the Window Vac Cleaner on the office windows, but it's so simple to use that anyone can use it. 1. First you have to mix the little sachet of cleaning liquid into the spray bottle. Then use this to spray the mixture onto the windows. Using the cloth wiper attached to the bottle, wipe the mixture around. This spreads out the cleaning liquid and lifts up the dirt. You can see all the dirt from the office windows left on the wiper in my photos, sorry about that! 2. After you've used the spray and wiper head, grab the Window Vac and pull the blade using downward motions on the window until all the dirt and cleaning fluid gets sucked into the machine and the pane is left nice and dry. Easy. 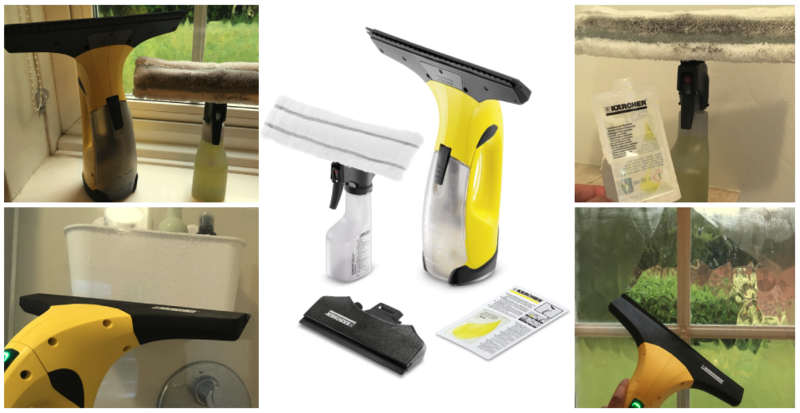 The Karcher Window Vacuum Cleaner Kit. 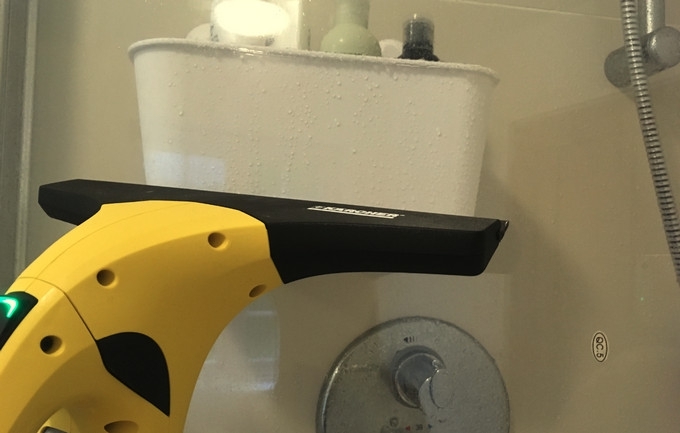 After the quick tutorial at work, I took my trusty Window Vac home to try it out for myself. The next day I had my morning shower, and everything inevitably steamed up. Grabbing the spray bottle, it was time to clean. 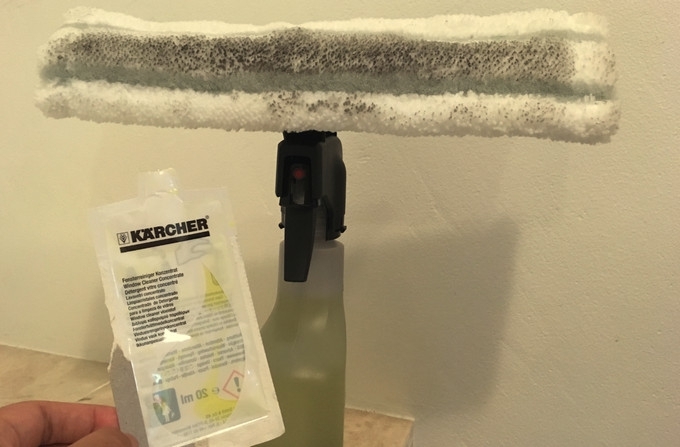 All you have to do is open the bottle, add the cleaning sachet that's included in your box, fill it with water and then spray the shower door. There's something quite satisfying about using the spray cleaner, and the microfibre head makes it super-easy to glide across the glass. After you've done this, pick up your Window Vac. I moved it from top to bottom on my shower door and hey presto, the Window Vac sucked up all the dirt and condensation up, leaving it completely dry. Unfortunately, it revealed how dirty the other side of the glass was, so I had to immediately clean that too. How lovely and shiny the glass looks now! 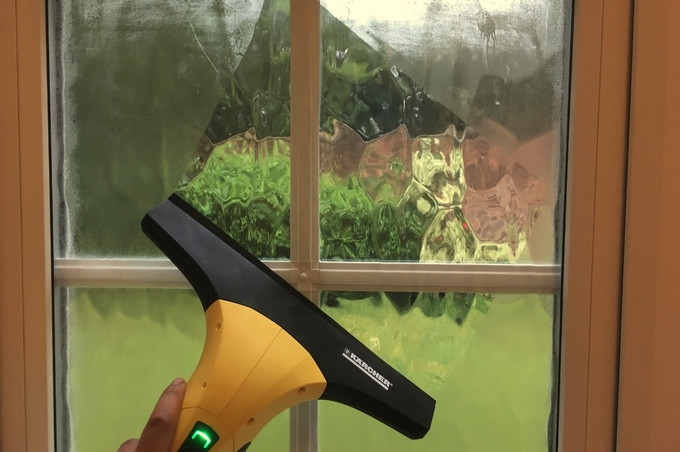 The WV2 Window Vac really is a joy - dare I say it, perhaps cleaning becomes more fun when you get to use gadgets like this. The box even includes a smaller head attachment for different areas of your home and it would work wonderfully on smaller windows. So impressive! It actually made cleaning the windows a joy, which is something I can't say about many cleaning products, or cleaning generally. I genuinely can't wait to try it on all my other windows. Dirty cloth wipers? Chuck them into a washing machine and you can use them again and again! A rechargeable battery and charger are included so you don't have to buy any batteries. Use it on bathroom tiles, mirrors, car windows. Easy empty plug for the dirty water. Leaves your surfaces completely dry and streak-free. 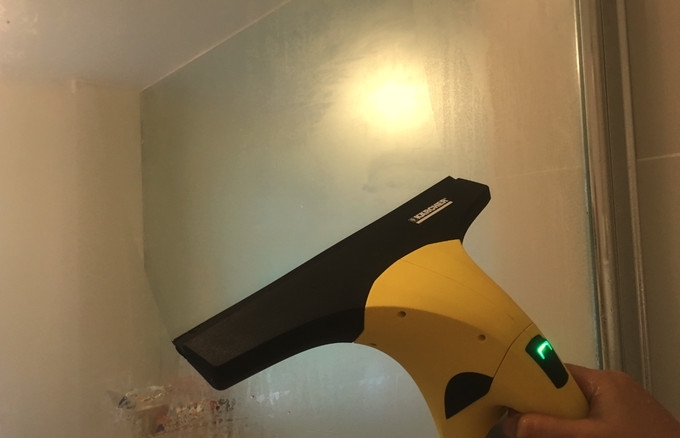 If you hate cleaning, have high levels of condensation in your home or just want to make cleaning windows as easy as it can be, then this product is for you. It's an impressive gadget and it is actually rather fun to use. You can buy the Karcher Window Vacuum Cleaner on Amazon. Thanks for your comment Enid - I agree, they're pretty special! It's really a great post. Window cleaning service is not an easy task. It needs special skill. You can contact Window Cleaning Fort McMurray for your job.